“Seeing ye have purified your souls in obeying the truth through the Spirit unto unfeigned love of the brethren, see that ye love one another with a pure heart fervently” (I Pet 1:22). 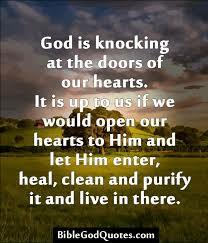 We need to purify our hearts because that helps us to obey the truths of God. The more our hearts are purified, the more we will be able to obey the truths. In the same way, if our hearts are not purified, even if deep truths from the Word of God are taught to us, we will not have the grace to obey them. If we pour delicious honey into a cup that is not clean, the honey will get defiled. Only a purified soul can be receptive to the deep truths of the Word of God. “Laying aside all malice and all guile and hypocrisies and envies and all evil speaking, as newborn babes, desire the sincere (pure) milk of the word” (I Pet 2:1,2). Dear reader, do you want to receive deeper truths from the Word of God? Then purify your heart in a deeper way. When the heart is not pure, your love too is not pure – “See that you love one another with a pure heart fervently.” This shows that, to love fervently or with Calvary’s love, we need pure hearts. St. Paul speaks of “charity out of a pure heart” (I Tim 1:5). If a person does not have a pure heart his love will not be pure; it will be but a false one.